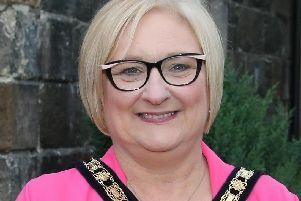 Elected members on Antrim and Newtownabbey Borough Council are set to debate “a breach of confidentiality” during a special meeting on September 5. The meeting has been called after Cllr Anne Marie Logue commented on social media regarding the council’s ‘English only’ policy after a discussion held behind closed doors. Cllr Logue pictured with South Antrim MLA Declan Kearney. In February unionist members on the local authority voted in favour of the policy in relation to street signs in the borough. On Tuesday, August 28, councillors discussed the policy in a meeting held in committee. The tweet has since been removed. An update on the council’s investigation will be tabled at the meeting. The motion has been backed by DUP representatives Cllr Brett, Ald Smyth, Ald Girvan, Ald Ball, Ald Barr, Ald DeCourcy, Cllr Ross, Cllr Magill, Cllr Clarke, Cllr Hamill, Cllr Greer, Cllr Flanagan, Cllr Girvan and Cllr Kells alongside Alliance representative, Cllr Billy Webb. Local Irish language activists have launched a Judicial Review to overturn the council’s ‘English only’ policy. It is understood the Judicial Review is listed in September for a Leave Hearing, whereby the judge will decide if there is a case to answer.